Some wealthy Washington schools get more money than needier ones in new budget. Here’s why. In Lake Washington, only about 1 in 10 students come from low-income homes. In Tacoma, more than half of students live in poverty. So why will Lake Washington schools get more money than Tacoma schools under the state’s new education budget? The Lake Washington and Tacoma school districts have a lot in common. Both enroll roughly the same number of students — 29,800 in Lake Washington and 29,100 in Tacoma. Both are trying to help about 10 percent of those students learn English. And both serve similar numbers of students with special needs — 3,300 in Lake Washington, 4,200 in Tacoma. But while just 11 percent of Lake Washington students come from low-income households, a staggering 58 percent of Tacoma students qualify for free- and reduced-price meals, a common barometer for poverty. So which district will get more money under the state’s new K-12 budget, which lawmakers last year hailed as a way to level the playing field between low- and high-family-income students? Lake Washington, actually. By the 2020-21 school year, when the K-12 budget goes into full effect, Lake Washington schools will get $3,224 more per student than they received last year. 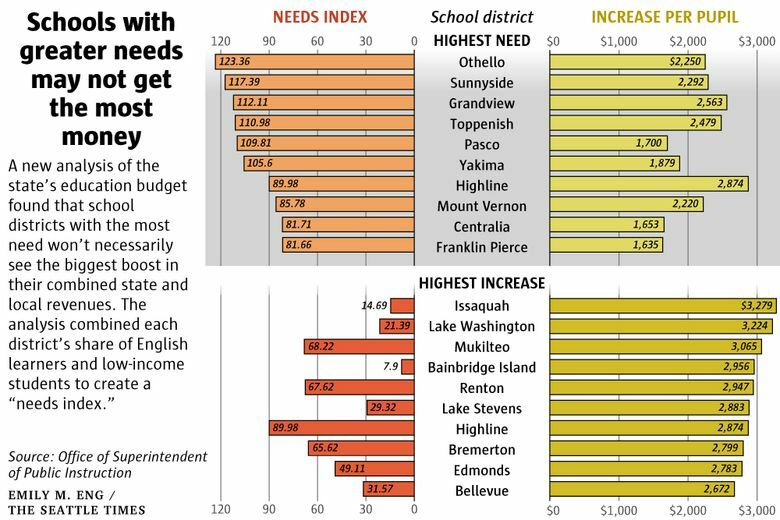 The high-poverty schools in Tacoma, meanwhile, will get a boost of just $1,061 per student. That means Lake Washington, despite enrolling significantly fewer low-income students, will collect nearly $21 million more than Tacoma in 2020-21. The disparity is one of many unintended consequences of the new state budget that districts have brought to the Washington Legislature’s attention since Gov. Jay Inslee signed the four-year spending plan into law. It also points to continuing confusion over how lawmakers decided to overhaul the state’s school-finance formulas as they try to satisfy a Supreme Court order to pay the full cost of providing a basic education for 1.1 million public schoolchildren in Washington. “It’s unfortunate that (some) districts will receive an incredible benefit while others of us will see fewer dollars to bring students up,” said Rosalind Medina, chief financial officer for the Tacoma schools. Similar scenarios are expected to play out across the state. In Issaquah, for example, the new state budget will funnel about $3,279 more per student into local district coffers. But less than 7 percent of students there are learning English, and only about 8 percent live in poverty. The Yakima School District, on the other hand, will see an extra $1,879 per student, even though a full third of its students are learning English and more than three-quarters live in poverty. Dave Larson, a Tukwila School Board member, discovered the funding gaps in a new analysis of the four-year education budget that state lawmakers rushed to approve last June under threat of a government shutdown. Using data from the state superintendent’s office, Larson combined each district’s share of English learners and low-income students to create what he called a “needs index.” He then compared that to projections of how much new money each district will get under the K-12 budget, hoping to find that communities with greater need would see a bigger infusion of cash. His analysis revealed virtually no relationship between the needs of a given district and its change in state and local funding. “The result is not too surprising, since I think equity — in terms of allocation based on student need — was kind of an afterthought for legislators,” Larson said. Legislative leaders believe the picture is a bit more complicated, and they argue that focusing only on the change in per-student funding overlooks the starting point for each district. Currently, many high-needs districts receive additional money from the state to support their at-risk students. Tacoma in fact got $11,636 per student last year. Lake Washington got only $9,695. Under the new formula, both will see more — Lake Washington will get $12,919 and Tacoma $12,697. To provide the bulk of that new money, lawmakers chose to increase the state property-tax rate while cutting what districts could draw from their local property-tax levies. But some districts — including Tacoma and about 10 others — won’t see a large enough increase in state revenue to make up for what they lose locally. “They’re unusual in the severity and size of the impact of the (new) levy policy,” said Democrat Christine Rolfes, the Senate’s chief budget writer. As the Washington Legislature approaches the end of its short session this year, it remains unclear what, if any, flexibility lawmakers will give to districts worried about the lower levy rates. Rolfes said the difficulty is deciding between offering relief to specific districts like Tacoma or crafting a policy that would impact all 295 districts in the state.